So this is officially the most disturbed book I’ve read ever. It was VERY well written and I couldn’t put it down but man was it graphic for me. it was just a little dark but I have to say I’ve got the bug and will with good probability read the other three books in this series. The disappearance forty years ago of Harriet Vanger, a young scion of one of the wealthiest families in Sweden, gnaws at her octogenarian uncle, Henrik Vanger. He is determined to know the truth about what he believes was her murder. He hires crusading journalist Mikael Blomkvist, recently at the wrong end of a libel case, to get to the bottom of Harriet’s disappearance. 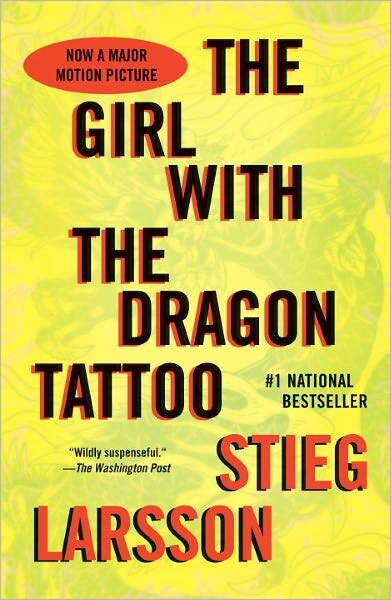 Lisbeth Salander, a twenty-four-year-old, pierced, tattooed genius hacker, possessed of the hard-earned wisdom of someone twice her age–and a terrifying capacity for ruthlessness–assists Blomkvist with the investigation. This unlikely team discovers a vein of nearly unfathomable iniquity running through the Vanger family, an astonishing corruption at the highest echelon of Swedish industrialism–and a surprising connection between themselves–From publisher description. This book surprised me, grossed me out, and made me root for the underdog character. Overall if you are a REAL reader and haven’t read this book, do it. If you’re looking for a good, quick, nice, easy book to read…I wouldn’t recommend this one :). Here’s a link to the movie site and trailer…haven’t seen it yet but looks pretty dark and true to the book.